They’re the captains of fine liquor, but navigating their spirituous seas can be challenging. I charted a course to the heart of French brandy. 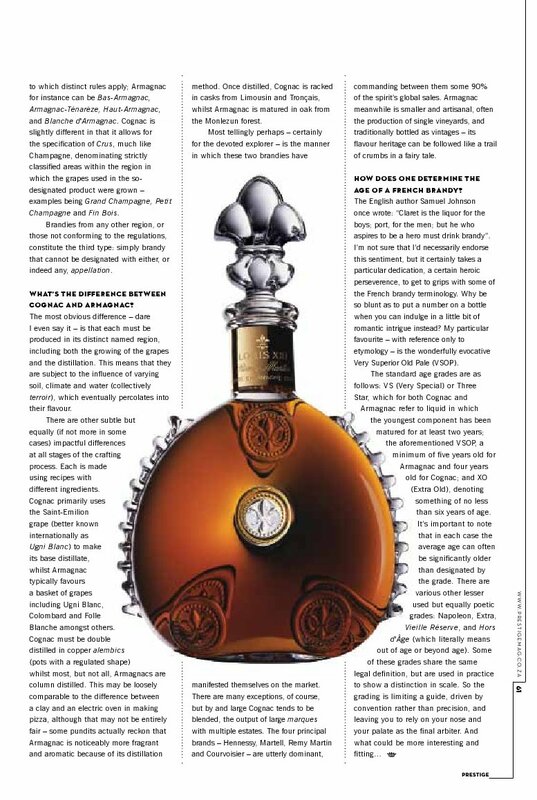 First published in Prestige Magazine (March 2013 edition). The fruit of the vine is often described as noble, with good reason. Its contribution to our liquid landscape is arguably unparalleled, having given us wine, in all of its myriad splendour; champagne and its fellow bubblies; sherry, port and their other lessor-known fortified brethren; assorted liqueurs; grappa; eaux de vie; and, last but not least, a variety of brandies. It was in France that the arts of exploiting the grape first reached its current cultivated proportions; specifically it is where the making of grape brandy became established and renowned. Today the French dominate this sphere – their brandies are globally the most highly acclaimed, and the most widely and voluminously sold. If you enjoy your brandy then you’d be well advised to seek out and appreciate their delicious nectar, if you haven’t already. The latter though may not be as straightforward as it seems, at least not fully; the French are an indecipherable bunch at the best of times, and their brandies, replete with seemingly unintelligible jargon, are no exception. Here then is a short guide to traversing the top tier. French brandy comes in three broad types, distinguished from one another by the Appellation d’Origine Contrôlée or AOC. The AOC is the system by which France governs the production and marketing of certain of its agricultural products. It is largely but not wholly based on the concept of terroir; essentially certain regions have acquired an exclusive right to assign their names to traditional product categories, and to legally compel production according to particular methods and standards. This status confers a special cachet to subscribing products, which generally translates to a price premium in the marketplace. There are two appellations specific to brandy: Cognac, the most well-known, and Armagnac, the most ancient. Additionally, for the sake of completeness, one should note that there are also often “sub” appellations to which distinct rules apply; Armagnac for instance can be Bas-Armagnac, Armagnac-Ténarèze, Haut-Armagnac, and Blanche d’Armagnac. Cognac is slightly different in that it allows for the specification of Crus, much like Champagne, denominating strictly classified areas within the region in which the grapes used in the so-labelled products were grown – examples of these being Grand Champagne, Petit Champagne and Fin Bois. Brandies from any other region, or those not conforming to the regulations, constitute the third type: simply brandy that cannot be assigned either, or indeed any, appellation. What’s the difference between Cognac and Armagnac? The most obvious difference – dare I even say it – is that each must be produced in its distinct named region. This means that they are subject the influence of varying soil, climate and water (collectively terroir), which eventually percolates into their flavour. There are other subtle but impactful differences at all stages of the crafting process. Each is made using recipes with different ingredients. Cognac primarily uses the Saint-Emilion grape (better known internationally as Ugni Blanc) to make its base distillate, whilst Armagnac typically favours a basket of grapes including Ugni Blanc, Colombard and Folle Blanche amongst others. Cognac must be double distilled in copper alembics (pots with a regulated shape) whilst most, but not all, Armagnacs are column distilled. This may be loosely comparable to the difference between a clay and an electric oven in making pizza, although that may not be entirely fair – some pundits actually reckon that Armagnac is noticeably more fragrant and aromatic because of its distillation method. Once distilled Cognac is racked in casks from Limousin and Tronçais, whilst Armagnac is matured in oak from the Monlezun forest. Most tellingly perhaps – certainly for the devoted explorer – is the manner in which these two brandies have manifested themselves on the market. There are many exceptions of course but by and large Cognac tends to be blended, the output of large marques with multiple estates. The four principal brands – Hennessy, Martell, Remy Martin and Courvoisier – are utterly dominant, commanding between them some 90% of the spirit’s global sales. Armagnac meanwhile is smaller and artisanal, often the production of single vineyards, and traditionally bottled as vintages, its flavour heritage able to be followed like a trail of crumbs in a fairy tale. How does one determine the age of a French brandy? The English author Samuel Johnson once wrote: “Claret is the liquor for the boys; port, for the men; but he who aspires to be a hero must drink brandy”. 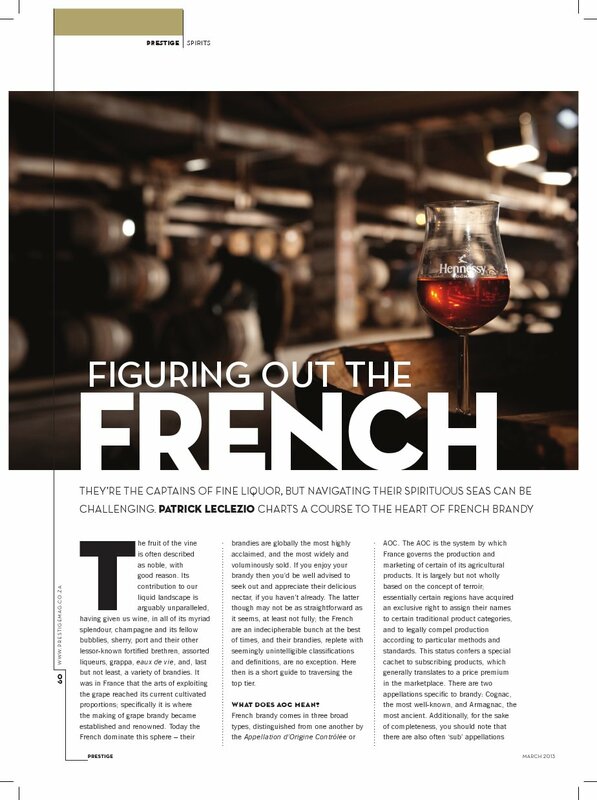 I’m not sure that I’d necessarily endorse this sentiment, but it certainly takes a particular dedication, a certain heroic perseverence, to get to grips with some of the baffling French brandy terminology. Why be so blunt as to put a number on a bottle when you can indulge in a little bit of romantic intrigue instead? My particular favourite – with reference only to the poetry of it – is the wonderfully evocative Very Superior Old Pale (VSOP). The standard age grades are as follows: VS (Very Special) or Three Star, which for both Cognac and Armagnac refer to liquid in which the youngest component has been matured for at least two years; the aforementioned VSOP, a minimum five years old for Armagnac and four years old for Cognac; and XO (Extra Old), denoting something of no less than six years of age. It’s important to note that in each case the average age can often be significantly older than designated by the grade. There are various other lesser used but equally poetic grades: Napoleon, Extra, Vieille Réserve, and Hors d’Âge (which literally means out of age or beyond age). Some of these grades share the same legal definition, but are used in practice to show a distinction in scale. So the grading is somewhat limiting a guide, driven by convention rather than precision, and leaving you – fittingly – to rely on your nose, your palate and your senses as the final arbiters. Santé! This entry was posted in Uncategorized and tagged Armagnac, Cognac, Distilled spirits. Bookmark the permalink.